More and more teachers are discovering each day that teaching with mentor sentences is the perfect way to teach grammar and author’s craft! Students will improve their writing and grammar understanding as they learn from the amazing authors of your favorite books! Need proof that mentor sentences are a best practice? Check out this case study! and to apply style, conventions, and mechanics skills to their own writing. The areas of style and conventions in writing are two areas teachers agree usually suffer in student writing. It has been proven by the National Council of Teachers of English (NCTE) that teaching grammar in isolation does not carry over into writing. It is imperative to combine grammar and writing instruction for students to see the connection and apply those skills. With the mentor sentence routine implemented correctly, students don’t just memorize grammar rules, but instead, practice grammar components within writing. Thousands of teachers are already redefining their grammar teaching and seeing amazing results from their students, and you can, too! Get your hands on an entire year of mentor sentence lessons! Check out your options by clicking here! Have more questions about mentor sentences? Check out the FAQ by clicking here! You can truly MAXIMIZE your teaching time by using mentor texts for several subject areas. Mentor sentences provide students the opportunity to discuss, learn, and apply grammar and craft skills presented in well-written sentences from mentor texts that can also be used for other lessons in the classroom. I am a huge advocate for using mentor texts. A mentor text is a short piece of text (in other words, one that can be “digested” in a reasonable amount of time) that will serve as a model for several skills. Stop reading one book or article for a reading lesson, a different book or article for a writing lesson, and then ANOTHER book or article for a social studies lesson! Use that ONE mentor text for as many things as you can! Are you excited to transform your traditional ELA lessons into fresh, integrated practices? or keep scrolling to read testimony from teachers who agree that these are total gamechangers, and must-haves for your classroom! 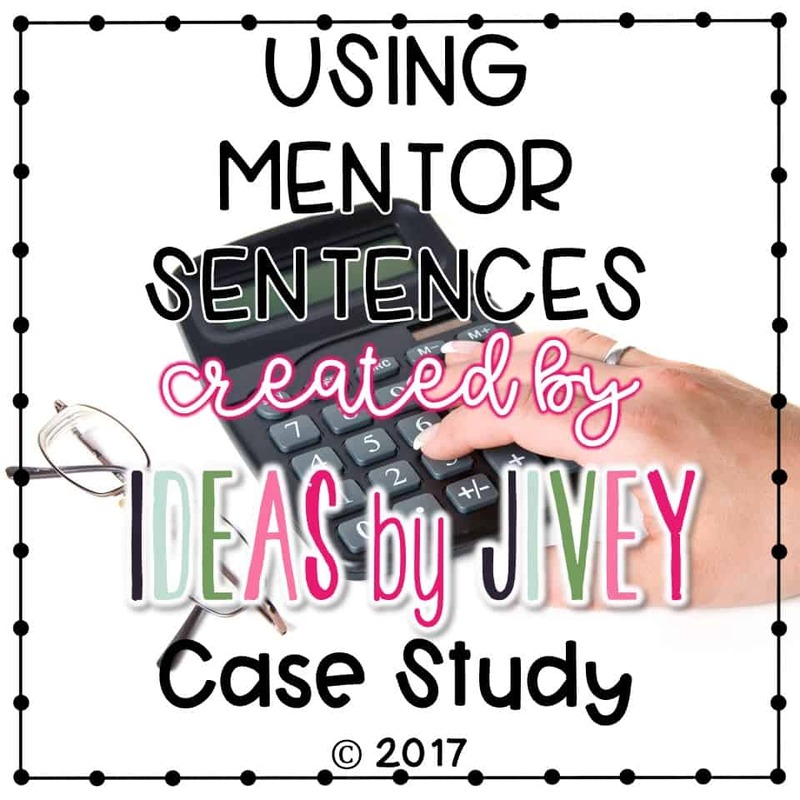 Why should I use mentor sentences instead of a sentence-editing program or grammar workbook? Mentor sentences teach mechanics, conventions, and style through well-written sentences instead of sentences filled with mistakes. Rather than students guessing what is wrong with a sentence, they notice what is RIGHT. This carries over into writing as you guide students to imitate the author. The learning happens authentically through discussions and mini-lessons, rather than sit-and-get lectures and worksheets. How long will mentor sentence lessons take? Once students learn the routine, you don’t have to give daily directions about what is expected of them. Your lessons will generally take 10-15 minutes daily. You are not ADDING 10-15 minutes to your schedule, you are replacing grammar in isolation as well as some of your writing mini-lessons (you will be practicing craft, style, and sentence structure/conventions every single week)! At first, it will take a bit longer as your students are going to need a TON of modeling, prompting, and explanation, just as with any other routine. 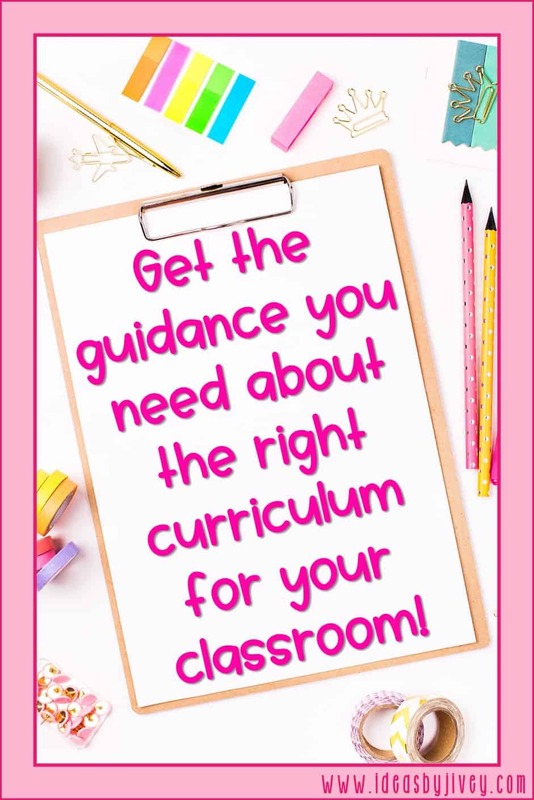 If you start out slow and gradually build up to “grade level expectations,” students will feel more successful, and you will be helping them establish the routine necessary for the whole year. Do I need to teach all the parts of speech before I begin mentor sentences? No! Remember, we are trying to move AWAY from grammar in isolation. This means, you probably won’t be able to discuss every single word in the sentence and its function, but you will work up to it over time. When you start, take baby steps and work up to “everything.” Will they all understand all the skills at the same time? Of course not- just like everything else you teach, students are going to be all over the map when it comes to understanding. But one of the BEST parts of mentor sentences… the spiral review every week! Students who aren’t “getting it” the first few times will get it down the road after seeing it several more times. Do I need to read the book to use the lesson? Yes, it is necessary to read the book for students to have context of the sentence. Not only does it help them feel invested in the lesson AND the book, but students are not going to be able to revise a sentence when they don’t have any details about it. If you can, try to read it at some point before starting your lesson, but if not, you definitely want to read it before “revision day.” I encourage you to use the book for other lessons, not just mentor sentences, to maximize your teaching time. Mentor texts are great for reading and writing mini-lessons, too! The books I have chosen are popular texts that can often be found in libraries or even on your co-workers shelves if you don’t want to purchase them all. 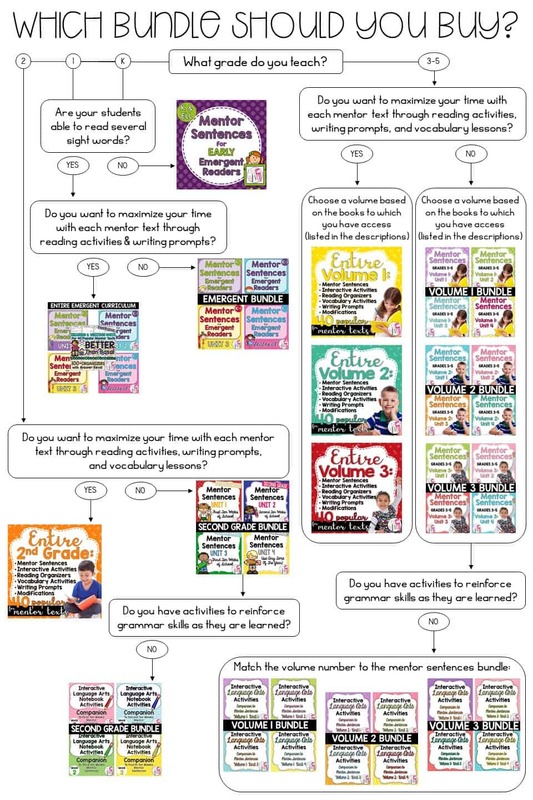 Why are there so many volumes of lessons for grades 3-5? 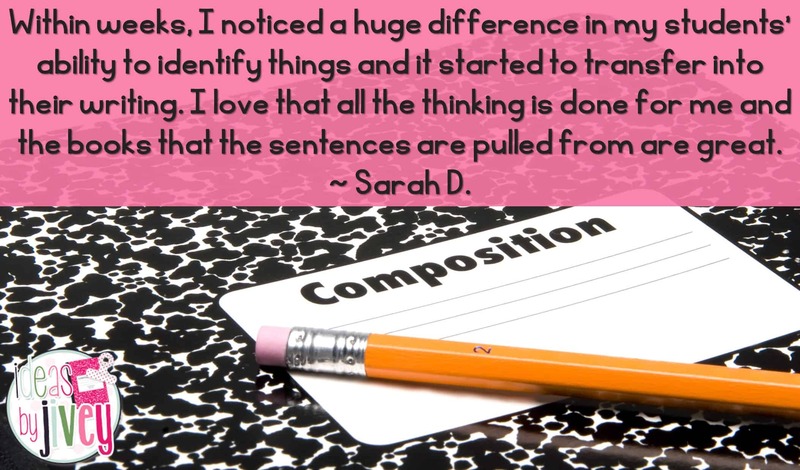 Mentor sentence lessons totally differentiate themselves based on your students’ grammar knowledge. Foundational grammar skills that are taught in third grade should still be reviewed in fourth and fifth grade, with more depth. For this reason, the same lessons taught in third grade CAN be taught in fourth and fifth grades too, because the conversations and students’ ability will be different. Of course, we don’t actually WANT to use the same exact lesson in all three grades, so I have created three volumes to allow schools to vary the lessons among the grade levels. If you are trying to choose a volume just for yourself, I always recommend looking at the book lists (found in the description of each bundle) and choosing based on having access to more of the books on the list. Which bundle should I buy? Still have a question? Send it below!